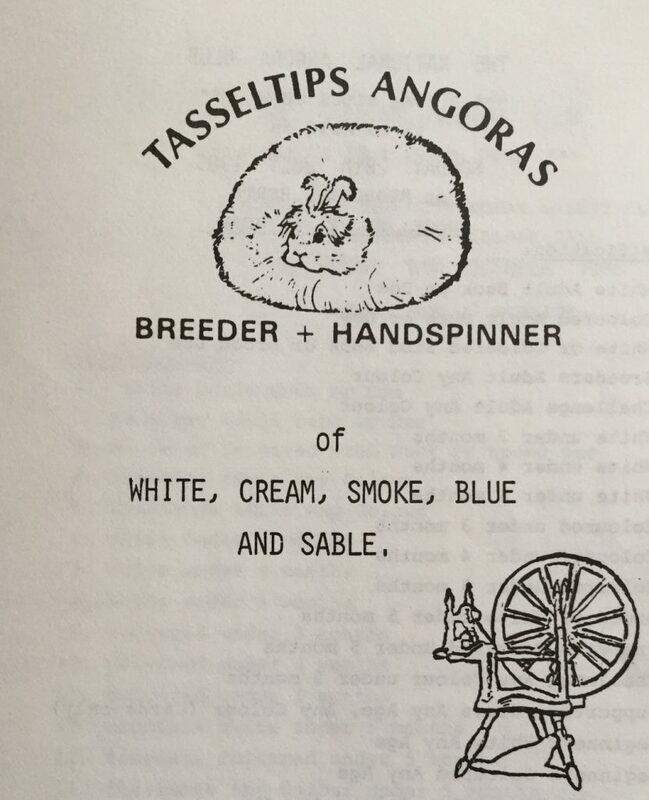 Sheila Leverett and her husband ran a commercial venture for fibre, under the stud name of Tasseltips Angoras, she was also very successful at showing them as well. I am often asked what makes a difference between a show rabbit and a commercial one. Basically they are the same, both must be properly fed and managed and both must come from good pedigree lines. A good rabbit is already determined in the womb by the condition of its mother. The doe must be well nourished but not overfed and she should be kept in the best conditions, in turn she will produce a good, healthy litter. Up until weaning both show and commercial wool stock are managed in the same way. After weaning the management of the two is quite different. A kitten destined for the show bench must be removed from the litter by six to eight weeks of age to prevent its coat from being chewed or spoilt by the others. It should then be carefully groomed daily and given a good diet but one that will not make it develop too quickly as this could lead to disqualification in under five month classes. At weaning the commercial wool rabbit need not be separated from its litter mates quite so soon. Does can be caged together for up to four months but bucks need to be on their own from ten weeks of age to avoid injuries from fighting. They have their baby coats cut off at eight weeks, this stimulates wool growth and also, inexplicably, makes the rabbit grow quicker. They are fed ad lib on a good quality pellet feed containing 16/17% protein, fibre and added vitamins. This ensures a well developed fibre producing rabbit at eighteen weeks. If building up a new unit then does can be bred for the first time at between 18-24 weeks and will produce up to six litters per year. Intensive breeding such as this will build your numbers up quickly and with good feeding there should be no adverse effect on the quality of the stock. It will, however, shorten the life of the breeding doe and she may not live beyond two tears of age. If breeding a doe for the first time and is left until 9-12 months of age and she is bred three times a year, she will probably breed until three and a half and will carry on as a fibre producing rabbit to the average age of about 7 years. A fibre producing rabbit should give a good harvest six times a year if managed correctly. The coat grows more quickly in warm weather so during the summer months they may need shearing every six weeks whilst in the colder months there may be eight to ten weeks between shearing. Cutting the coat stimulates wool growth so that the more often they are sheared the more fibre will be produced. We shear our does as soon as the coat has reached 3” in length, but we shear the bucks when their coats have reached 21/2” as they are more likely to chew their coats if left any longer. Beware of Angoras being sold as wool rabbits because they don’t come up to show standard, if anything a commercial rabbit needs to be of the best quality although the odd missing ear or tail will not matter in the commercial angora. Coloured angoras for fibre must come from best pure colour bred stock that will breed true to colour with as little variation in shade as possible. This will only be possible from stock with many years good breeding behind it. If buying stock from a commercial production always go and see the rabbits before purchasing them, take the advice given by the breeder and do not be afraid to as his/her advise in your first few months of angoras keeping, as this is what you are paying for when you buy your foundation stock. Beware of the breeder who sells you the stock and then gives you somebody else’s name or telephone number to contact for advice or problems, this person may not be very pleased to help as the initial cost of your stock should include giving advice. Sometimes you can buy show rabbits but it will be to your credit to breed tour own. It doesn’t matter how much you pay for a show rabbit or how good it is, with an inexperienced groomer it can be ruined in a few minutes. So buy your first rabbits and let the breeder show you how to groom and then practise grooming them so that by the time you have bred your first litter you will havre some experience of grooming and be more likely to succeed on the show table. Posted 01/11/2018 by SM & filed under General interest.